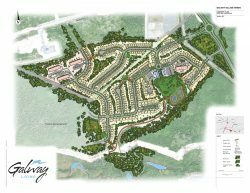 As the first master planned community in the province, Galway will combine the convenience of city living with the quiet, calm residential experience of a small town. A “master planned community” is a community that includes a mix of land uses which are planned comprehensively to function together. This unique 2,400-acre master planned development will consist of residential neighborhoods, light industrial/mixed use business centre, and a premiere retail space. Galway Living will also include a number of recreational amenities such as parks, golf courses, bike paths, and walking trails. The scope of a master planned community is generally large scale and the number and variety of amenities separates it from traditional housing subdivisions.